› When: Opening reception, 6-8 p.m. Friday, April 5; through Sunday, May 26. The Chattanooga region of the Tennessee Watercolor Society will open a "Line and Form" exhibition Friday at Michael's Fine Art and Framing in Dalton, Georgia. Don't read too much into that theme though, says member Lynne Mayer. "Any composition is first done with a drawn line, and then you create form," says Mayer. "It's very general." So the wavy, muted effect of Mayer's painting of clown fish swimming amid sea plants fits the description as well as Lupina Haney's architectural-style renderings of homes. "It's not like a little teensy house sitting on a hill," Mayer says of Haney's works. "It's the architecture of a building that takes up the whole canvas. You're looking at columns and windows. It's all abstract-looking. That's definitely line and form." Similarly, don't focus too much on the word "watercolor" in the group's name. 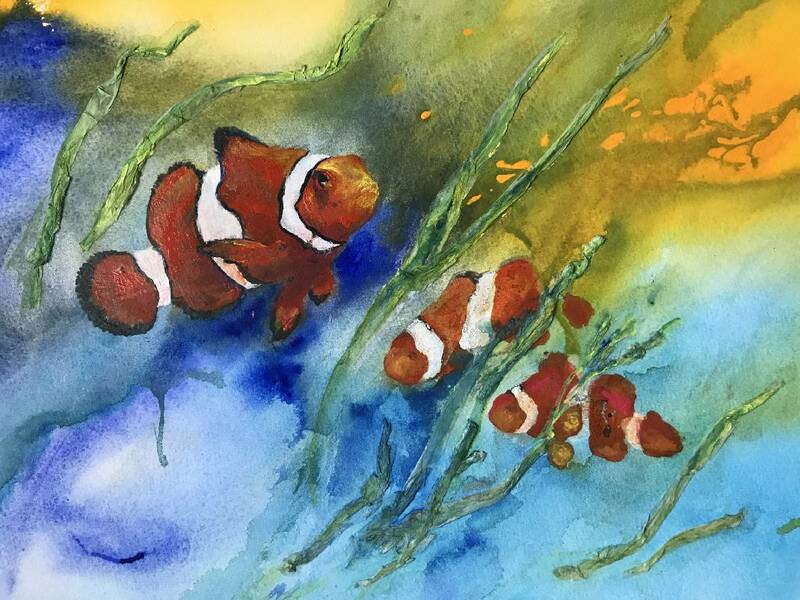 Mayer says the Tennessee Watercolor Society philosophy now encompasses the broader term "water media," which also includes acrylic paints, a water-based medium. "It's only been in recent years that they've opened it up to acrylics," Mayer says of the TWS, which has been active since 1971. The change in philosophy reflects the busy lives of many artists. Acrylic paint is an easier medium, Mayer says. 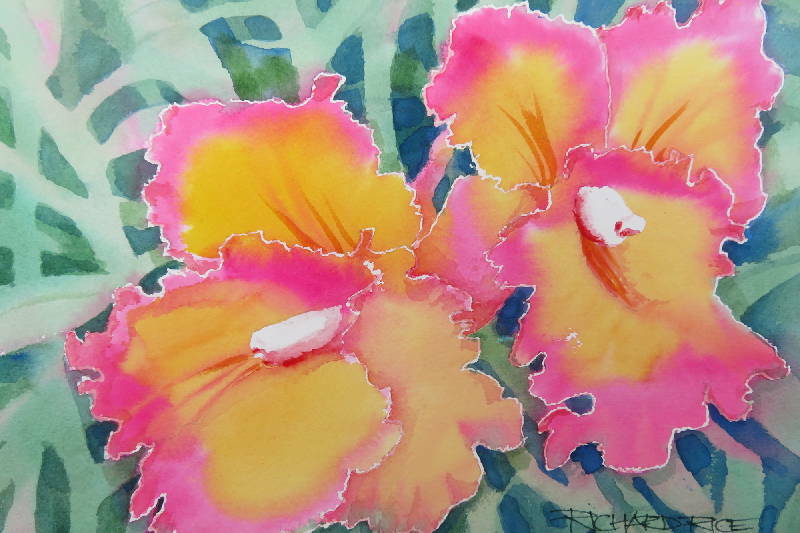 "Watercolor is a very difficult medium to work with," she explains. "You have to be practiced to be good at it. In modern times, people have moved to the new medium of acrylics." Acrylics have several advantages over oils, she says. Because they're water-based, cleanup is easier and drying is faster, typically within an hour for acrylics, compared to days or even weeks for oils. Acrylics also offer "exciting techniques," such as collaging. Yet another reason for the turn to acrylics is societal, Mayers believes. "In my experience, it's what people are desiring more in their homes and businesses," she says. "They want a more expressionistic, abstract look," such as that popularized by Jackson Pollock. "He took acrylic paint and a very large canvas and just threw it on there to reflect what he was feeling," she says. "He's very famous for that free-flowing, throw-the-paint method." Mayer says the Chattanooga region of the TWS includes 51 artists from Athens, Chattanooga, Cleveland, Etowah, Hixson, Jasper, Lookout Mountain, Ocoee, Ooltewah, Red Bank, Signal Mountain, Soddy-Daisy, South Pittsburg and Whitwell, as well as Ringgold in North Georgia.. Eight artists have contributed 31 paintings to "Line and Form." The show opens with a reception Friday evening and will continue through May 26. Contact Lisa Denton at ldenton@timesfreepress.com or 423-757-6281.